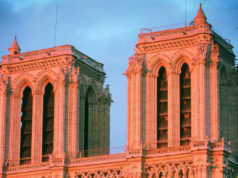 The Bonjour Paris editorial team recently requested reader submissions with memories from first trips to Paris. We were overwhelmed with wonderful responses, which we are publishing in a special series. (Read other installments here.) 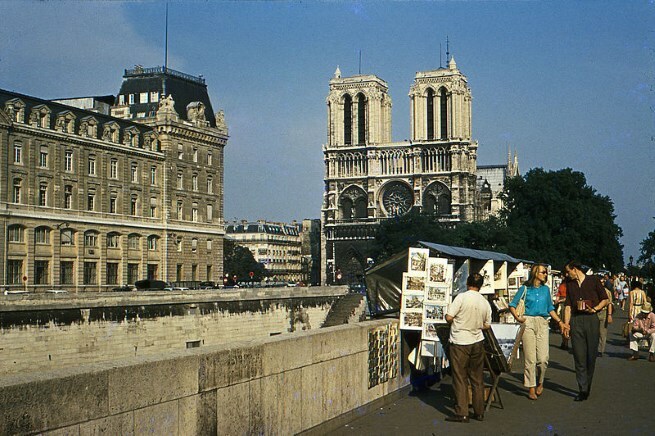 Below, writer Roni Beth Tower captures the nuances of a changing Paris– from the 1960s to today. In 1960 when I was sixteen and newly graduated from high school, my father took me to Paris. That was back when he had his haberdashery made at Sulka, stayed in 5-star hotels, and read the International Herald Tribune each morning when he was there. A committed bachelor, he returned to Paris each year since he had first discovered it in 1950. On our trip together, he introduced me to escargots and champagne and cheeses as a separate course. We saw Ravel’s Daphnis et Chloé at Opéra Garnier, sat on red velvet banquettes and listened to violins at Maxim’s, ogled the scanty (or absent) costumes of chorus girls at the Lido, rested during a boat ride on the Seine, surveyed the landscape below while lunching at Jules Verne in the Eiffel Tower, and marveled at Winged Victory as she presided over the top of her staircase at the Louvre. 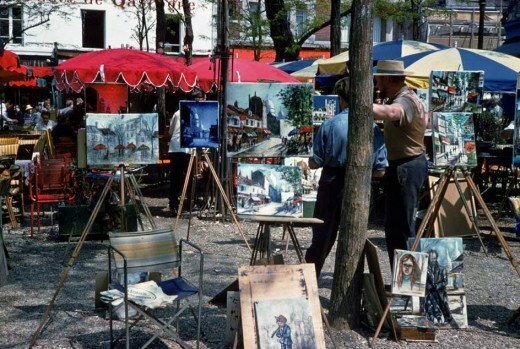 We spent hours watching the world go by from front row seats in cafés, studying windows of haute couture on Avenue Montaigne, sipping aperitifs and eating crèpes on Place du Tertre. He bought me a small oil painting of a couple clearly in love and an authentic sailor’s peacoat. And of course there was the haircut that transformed my dowdy Midwestern adolescent self into the more sophisticated college freshman she hoped to become. As a child escorted by a parent, I fell in love with Paris on that first trip. By the summer of 1963, I had no home. My father had remarried two years before, to a woman with three children of her own to raise. My mother had moved from Ohio to San Francisco where she would become a secretary and then a locally recognized artist. I needed a place to live when the spring semester ended. Besides, I needed three additional credits in order to graduate the following spring. I bought a ticket on a charter flight, enrolled in Summer School at the Sorbonne, arranged housing at a women’s residence on Boulevard Raspail, packed forty pounds of clothes and miscellany into a single suitcase, said goodbye to my boyfriend and boarded a charter flight. That was the first trip of a student, living on croissants and sandwiches au camembert; of walking 14 miles the evening, night and morning of Bastille Day; of mustering the courage to enter a tiny shop to buy a navy princess-cut coat when I was miserable because July nights were far colder than I had anticipated. It was the summer of cutting through the Luxembourg gardens on the way to the stark but privileged classrooms of the Sorbonne. I claimed the city as my own, mastering most of her arrondissements. I boarded local trains to Chartres, to Versailles, to the Bois de Boulogne, to the races at Saint Cloud. On my last day there, I stood facing the fountains at Place de la Concorde, my back to the gilded gates to the Tuileries, the Jeu de Paume on my right and the Orangerie on my left. I looked up at the Arch and back to the Louvre, and vowed I would return to Paris, but not until I could come back with a man I loved. Thirty-three years was a long time to be away. The 19 year old girl who had claimed Paris as her own in 1963 had had her whole adult life in front of her. Now, suddenly, here I was, middle-aged, realizing how foolish my vow had been and that I needed to return to the source that had sung to my soul, to the place where I had discovered the spontaneous joy and receptivity that were later lost in the cultural demands of doing rather than being, of accomplishing rather than exploring, of giving love rather than receiving love myself. It was my third “first trip” to Paris, one taken by an empty-nested, thrice-married clinical psychologist rather than by a naïve and star-struck teenager or an adventurous college senior. It was the trip “home” to a part of me that I had long ago left behind. The year was 1996. Navigating Charles de Gaulle airport’s then-bewildering (yet to be renovated) circular Terminal One, I eventually found the newsstand that sold phone cards, bought a Museum Pass at the tourism desk, and then joined the queue for the Air France bus to the Etoile. Nestled inside the modern le Car, I watched the morning landscape as it rolled past on the way into the city. Decorative sound screens lined the highway, graffiti affirmed local talent, billboards advertised international corporations. The construction that was becoming the Stade de France for the 1998 World Cup popped into view. Shortly beyond, majestic as always, luminous and curvy Sacré Coeur perched like a crown atop its small mountain. Spoken French surrounded me and I prayed that my ear might soon again become attuned to its lilting rhythms and round sounds. The softness of the landscape and the language began to relax my own edges, too long exposed to Manhattan’s hard angles. I consulted my “Plan”, the small worn book of maps, arrondissement by arrondissement, that I had saved all these years, the hope of returning never totally buried. 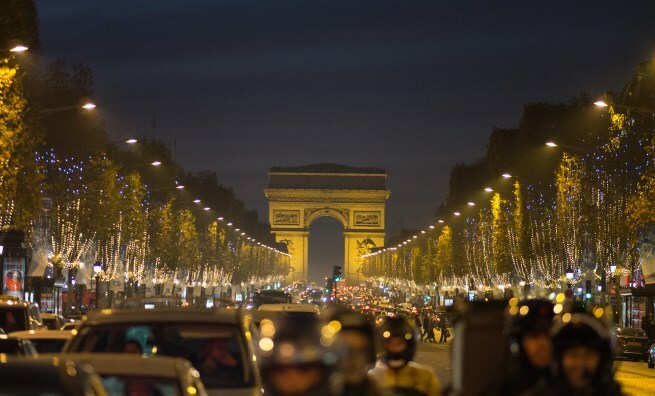 The bus left the Périphérique at Porte Maillot and then, a short drive beyond, there was L’Arc de Triomphe, as grand and stately as ever, but now presiding over a broad avenue, sidewalks wider than some streets, with a center boulevard free of any parking. I gasped. Not quite the same Champs-Elysées that I had left in 1963. The lineup remained as I had remembered it: The Arch, the Obelisk at Place de la Concorde, the gates to the Tuileries and then the little arch announcing the Louvre. But it all seemed so much brighter, more orderly. And it was. 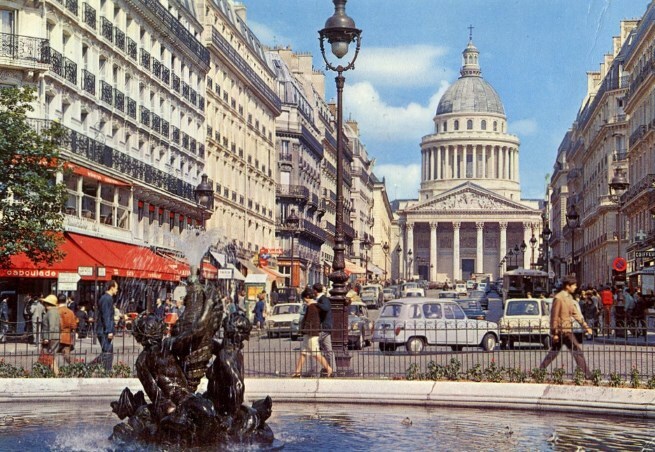 As in so many places in Paris—the Invalides, the Louvre, Notre Dame, for example—parking lots had been constructed underground, kiosks and streetlamps renovated, restored and freshly painted, boulevards and walkways swept clean of cigarette butts and stray papers. Paris was taking pride in her presentation. Underground, I bought my first carnet and slipped a ticket into the metro turnstile. I had forgotten how large and confusing the station at the Etoile could be. Eventually I found Line 6 and the entrance for Direction “Nation”, and finally I stood on a platform to board the metro for the first time in decades. Gone were the massive steel gates that clanked closed at night, the wooden seats on trains filled with a generation of women widowed by the war. Instead, cars were clean, billboards lining the station informative or entertaining, and the passengers diverse, courteous, orderly, and often stylishly dressed. The metro rose above ground at Bir Hakeim and I got off, trying to identify anything that seemed familiar. This part of the 15th seemed frighteningly unfamiliar, but I studied my maps again. Just a block away, I found the river and followed it. The Eiffel Tower sprang into view, larger than life, breathtaking in its security as one of the world’s best-known landmarks. Walking along the Quai de Grenelle, I turned right onto Avenue de Suffren. And there, across from a pristine soccer field, with its entrance on a tiny side street, lay my hotel, the base-camp for the adventure. The trip was to change the rest of my life, making Paris a central part of it forever. 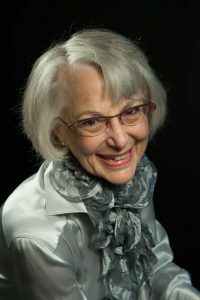 Roni Beth Tower grew up in Akron, Ohio, majored in religion at Barnard College, earned her doctoral degree in clinical psychology from Yale University, and did postdoctoral work in epidemiology and public health at Yale Medical School. 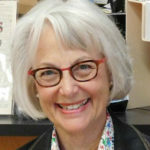 In addition to doing clinical work, she taught and did research at Yale and at Teachers College, Columbia University. Her speciality was close relationships. She and David, her husband, live in Tarrytown, New York, within easy visiting distance of their six grandchildren. They return to Paris as often as possible. In addition to David, their family and friends, she loves yoga, dance, quilting, and bringing comfort and joy to people. Was the hotel you stayed at in 1996 Hotel Hilton Suffren? My wife & I have visited Paris 11 times now & on our 2nd & 3rd vacations there, that was our hotel, with a view of the Eiffel Tower & the soccer field from our balcony. On those occasions we dined frequently at Chez Ribe, across the intersection from the hotel. On subsequent trips we have always stayed on the Left Bank, close to the tower, but further to the east, closer to Les Invalides. Yes, Brian and Steve! The hotel then was indeed the Hilton Suffren. Now it is a Pullman and the bar no longer is on the second floor overlooking the Eiffel Tower. Still a terrific location. but so is the area around Invalides. 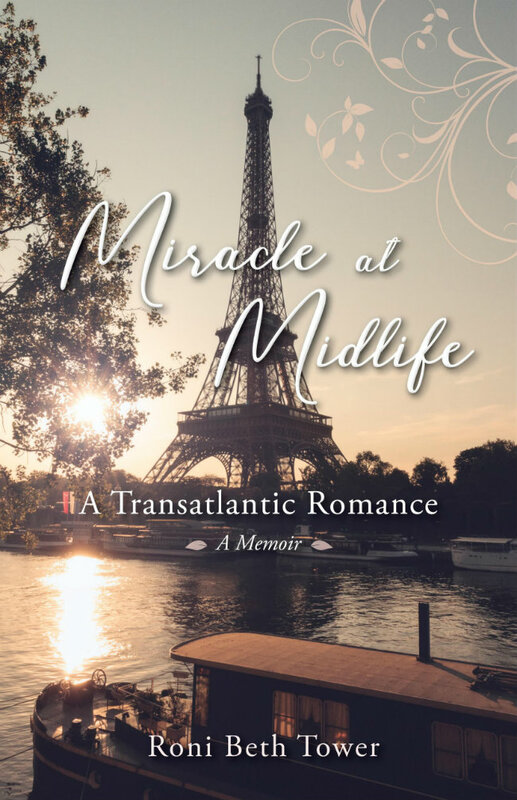 (That was the neighborhood in my book, Miracle at Midlife: A Transatlantic Romance.) 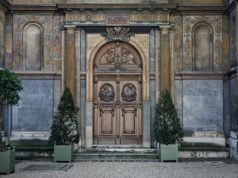 Do you know Florimund or Auberge Bressane on av de la Motte Picquet, slightly west of the Invalides? Funny-I had the same thought. I stayed at the Hilton several times. First time in 1998. Miss it. Such a beautiful story. Thank you so much for sharing Ms. Tower. Thanks, Hamilton. Glowing memories – I’m glad they can light up your own. 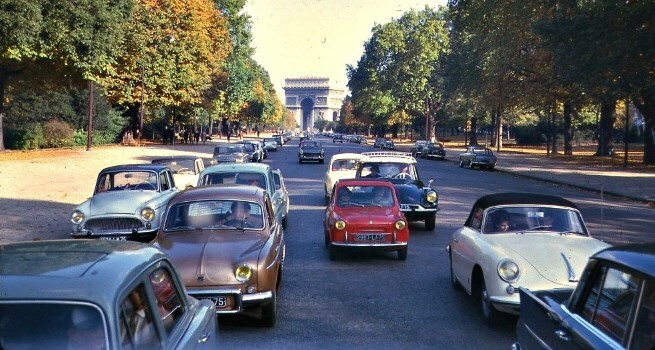 I shed a tear (several) as I read your story, thinking of my own “first” with my husband on our grand tour (our own Planning) in 1965, spending two months in Europe with a wonderful week in Paris and several days in the south of France. I vowed to return, finally doing so to visit my sister and her husband in 1996 for two weeks. Since then, I’ve returned 10 times, visiting as often as I can. This reminds me, the last trip in 2014 needs repeating. Thank you for a wonderful story. Fascinating. Three different trips, three different experiences. Thanks for sharing them. My first trip to Paris was as a single 24-year-old. Money was tight and communication was not what it is today. I remember all too clearly the despair of traversing the city several times underground and still missing the friend that I had come to see, being shadowed by unwanted male presences and feeling slightly out of place and awkward on my own. That said, returning 24 years later, I was excited to re-kindle the magic that I imagined that I had felt all those years before. It was still there.